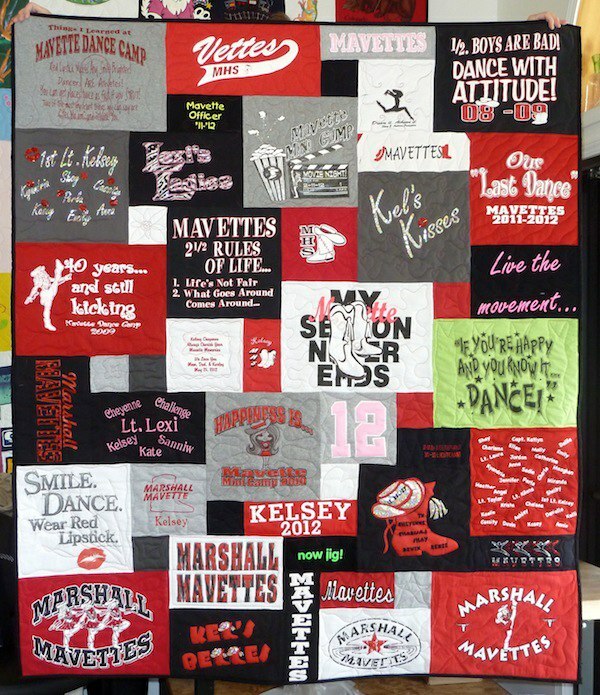 What can you use in a T-shirt quilt? 5 Things to Consider When You Are Deciding if a T-shirt Belongs in Your Quilt. Which T-shirts should you include in your quilt? This is important! Once a T-shirt is in your quilt, it’s not coming out! With this in mind, look at your T-shirts as a whole and individually. Look for what doesn’t belong. Here are 5 things to look out for when you are choosing your T-shirts. 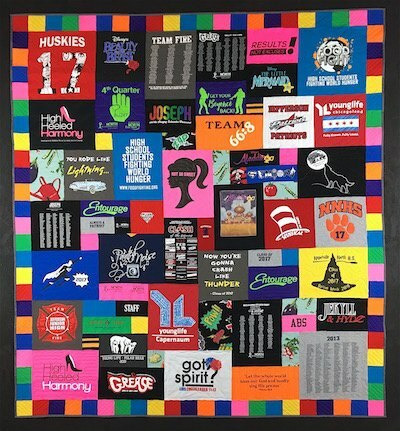 I am always amazed that we can take almost any group of T-shirts and make them into a cohesive quilt. It’s like this awesome magic trick that works… most of the time. It’s those times that it doesn’t work that have helped us figure out what works and what doesn’t work. As I said, most of the time we can blend any number of colors of T-shirts together and they work great. Here are times you need to make a choice. When all the T-shirts are the same color – except one or two. For example, all the T-shirts are black, except one. It is royal blue. This one T-shirt will not work! Why? Because when you look at the quilt, all you will see is that one blue shirt. Your eyes seeks out things that are not like everything else. The anomaly. The thing that is out of place. It’s a survival mechanism. You want to be able to see the lion in the bushes. Our ancestors who saw the lion the quickest were the ones to live to reproduce. Thereby passing on the gene that helps you quickly pick out what’s different. So, you will see that one-off colored T-shirt block right away. Everything else is background. In a quilt with just black T-shirts, the black of the T-shirts becomes the background. What’s printed on the T-shirts becomes what you look at. Read more about all black T-shirts here. If you are making a monochromatic quilt. I am defining a monochromatic quilt as a quilt that has one color of T-shirts plus black, white and gray shirts. If you have just one T-shirt that is not in the color scheme, this shirt will stick out. Badly. You need to decide if it has to be in the quilt. If it does, we can work with you to add more blocks of this same color to your quilt. That way, there is not just one spot for your eye to settle on. There are a number of spots with that color. If you love this T-shirt but realize that it just won’t work with the other T-shirts, you have the option to have a pillow made. Read more about pillows here. One T-shirt with a different color tone. When I am referring to a T-shirt’s tone, we are looking at the density of color. Some T-shirts are vivid and bright. Others are more muddy and muted. For example, think of the “Life Is Good” T-shirts. Most of these shirts are muted. Not very bright. If all your T-shirts were muted, you would not want to add one bright vivid colored T-shirt. Again, all you will see when you look at the quilt is that one T-shirt. It just doesn’t belong in with the muted T-shirts. When you are making a large quilt that has a lot of colors that are different tones, you won’t have an issue. It’s the one-off shirt that will present a problem. 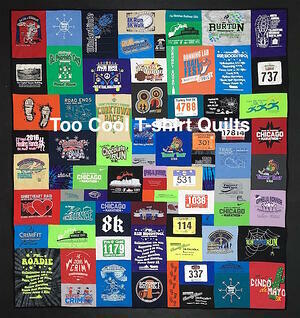 To learn more about the different types, styles and qualities of T-shirts, download our T-shirt Quilt Buyer’s Guide. It’s a great place to begin your journey to finding a quilt maker. Every quilt has a topic. 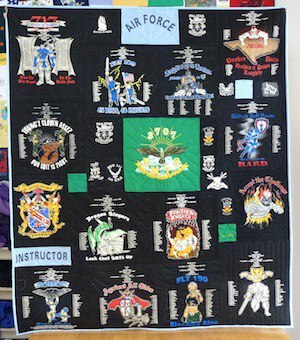 Even if it that topic is just “my life.” If your quilt has a specific topic, any T-shirt, which is not on that topic, should be removed. For example, say you are making a Harley-Davidson T-shirt Quilt. You have one Hard Rock Café T-shirt. We would suggest that you not use that one T-shirt. It just doesn’t belong. Also, I think it would lower the value of the Harley-Davidson quilt for future owners. It’s diluted the power of Harley T-shirts. Here’s another example that is less theme quilt related. Say you are telling the story of your child’s high school experience. And as you are putting together her T-shirts, you find her old blanket. Should you include this in the quilt? Probably not. You are telling a story about a specific time period. The baby blanket probably is not from the time period. On the other hand, if you are telling a “this is my life” story, the blanket might belong. It would work if you include other items from early childhood through to the time you are making the quilt. And yes, we have used many baby blankets in T-shirt quilts. You can read more about baby blankets here. Time frame. Look at what time frame your T-shirts are from. An easy example is if you are making a quilt from all the races you ran in the 1990’s. You would not want to include just one T-shirt from the 80’s or one from the 2000’s. You should keep the timeline tight. But if the T-shirts are important and you want to include them, you might then choose other T-shirts from a larger time span to include. We make a running quilt for Andrew every two years. Andrew races. A lot! As he and I go through his T-shirts, we try to eliminate T-shirts that are older or newer than the 2-year time frame. So far, we have made Andrew over 12 quilts! He lives to run! 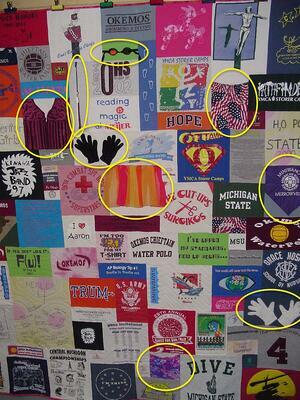 T-shirt quilts tell a story. Look at the T-shirts and see if they all are part of that story. If a T-shirt is not part of the story, you should consider removing it from the pile of T-shirts you send us. For example, you have T-shirts from your child’s life. In that stack is a shirt that belongs to someone else in the family. This shirt should be removed. Always double check that the T-shirts you are sending to us. Check and double check that all the T-shirts belong to the story and the character of the story. Remember, once a T-shirt is in your quilt, it can’t be removed. 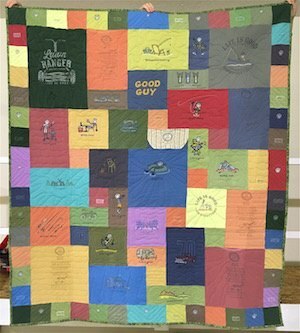 If you are a runner and want a T-shirt quilt made from your running T-shirts make sure that all the T-shirts are from running events. If you have 26 T-shirts from 5k's and one from a baseball team, the T-shirt from the baseball team just doesn’t belong and should be removed from that grouping of T-shirts. All your T-shirts are from 80’s rock bands. Except for that one T-shirt that is from a 2005 folk fest. You might consider removing it from the grouping of T-shirts. It just does not belong. Note: we can use very old T-shirts - so don't let the actual age of a T-shirts keep you from using it in your quilt. Not all your T-shirts need to be T-shirts. You can use anything in your quilt that is machine washable. For examples, sweatshirts, jerseys, nylon coats, etc. Read more about what can be used in a quilt here. 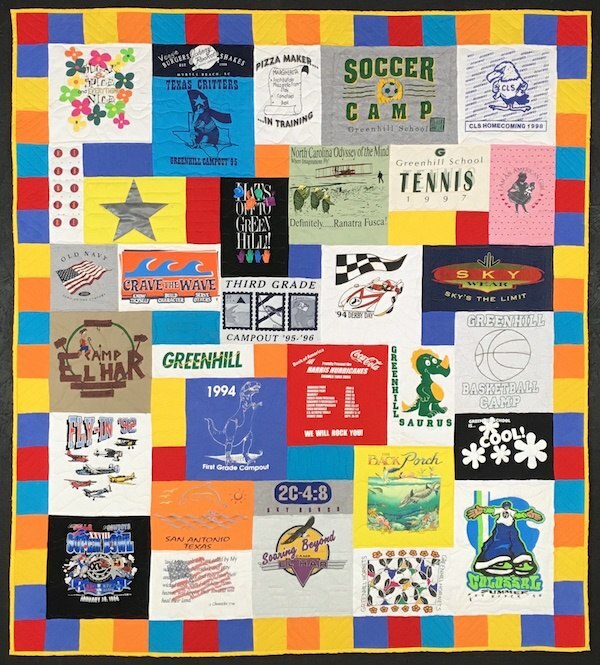 If you have any questions about the T-shirts you have picked out for your quilt, please give us a call. We have made thousands of T-shirts quilts. We have the experience to help you make good choices. Why is it important to carefully select your T-shirts? Some people just throw a huge stack of T-shirts in a box and call it good. Then when the quilt comes back, they say, “I didn't want that T-shirt.” We would have no way to know if you want T-shirt or not. It’s your responsibility. Remember, once a T-shirt is in your quilt, it's there to stay! Enjoy the process of deciding which T-shirts to include in your quilt. Whenever I make a new quilt for myself or my family, I take my time and look at all my T-shirts. I look at content and color. I have left out T-shirts that I love, but would have made my quilt look unbalanced and awkward. 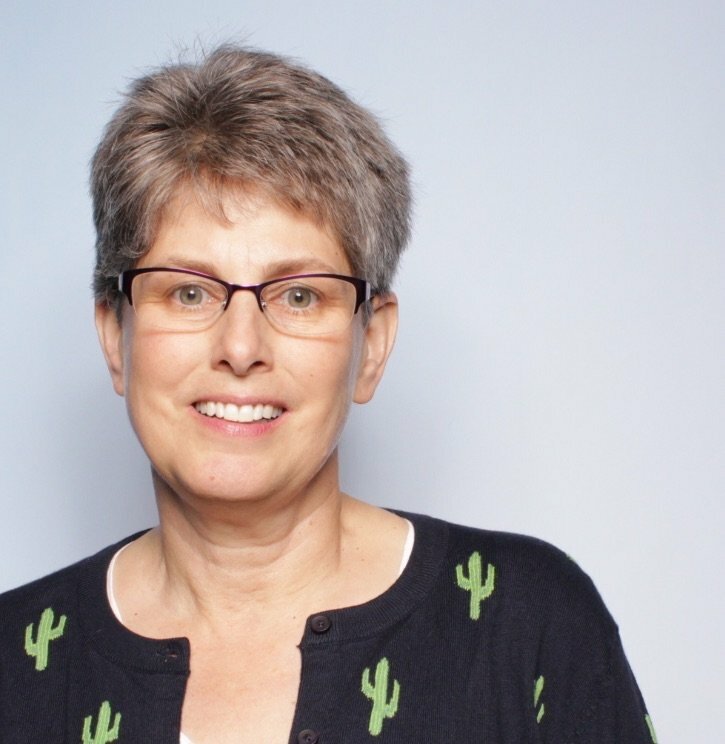 Andrea Funk is the inventor of T-shirt quilts made with multiple blocks sizes. The modern method of making T-shirt quilts. 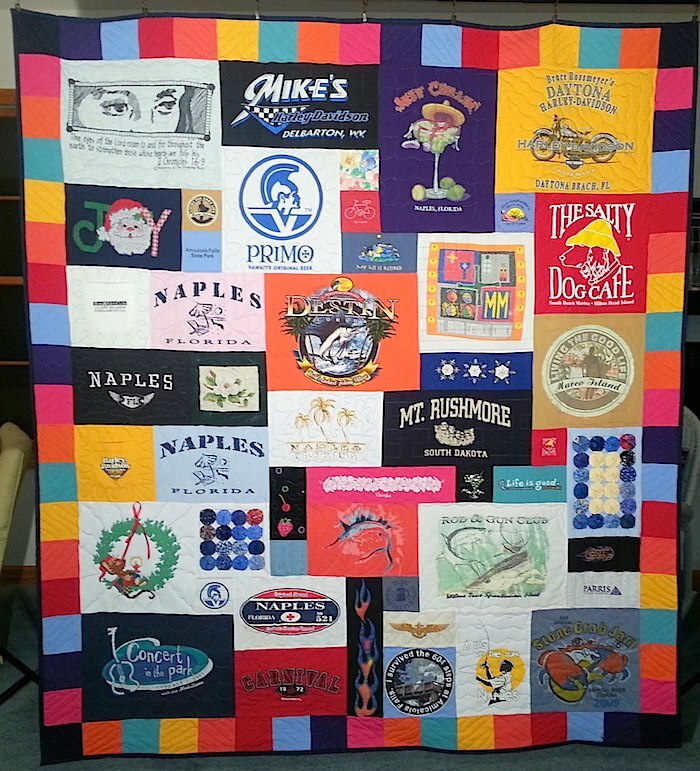 In 1992 she founded Too Cool T-shirt Quilts. Her life has been immersed in T-shirt quilts ever since.